Countless hours of proposal writing, delightful and tedious nights spent with Excel spreadsheets, amazing feelings of common purpose and collaborative editing …. where has this brought us? The Climate CoLab is organized by the Massachusetts Institute of Technology, one of the world’s leading universities, and creates yearly competitions to tackle one of the world’s most pressing problems: Climate Change. With over 17,000 members the Climate CoLab has developed into an internationally recognized hub for innovative solutions and social entrepreneurship. So What is Kijani Doing There? Our Proposal on Climate CoLab. Impressed by the reputation the Climate CoLab enjoys, and inspired by all the wonderful ideas that have been created and supported by this initiative in the past years, we thought “why not give it a try?” and wrote an application in mid-July this year. So what happens when we think “oh yes, let’s participate in this competition”? Of course we’ll give it our best. We thought, even if we make it just one round further that’s already a great boost of motivation for the team, and if we make it to the Finalist round we could count Kijani among some of the world’s most innovative climate solution start-ups … and why not shoot for the big win directly — with every word we are typing into the proposal online form? What wonderful news! What an empowering feeling that our vision for Kijani is shared by others, and that our efforts are appreciated in such a way. Okay, the race was not over yet. We had ten days’ time to revise our proposal and address the comments we had received from the judges. With the motivation of our first success guiding our actions we threw ourselves into addressing the judges’ constructive feedback to hone our proposal. Now, how do you include new aspects into a proposal if you already carefully squeezed the text into the maximum amount of allowed characters per section? Right, you have to delete quite a bit of text and describe everything with half the words you used before. Okay, we like to believe that we managed that. So we re-submitted our revised proposal and left it to the judges one more time to decide our fate. Additionally, another round of email blasts earned us some more “supporters” on the website, now growing to 108 registered accounts and clicks for us. That’s the email that brought us where we’re now. Kijani’s proposal is one of the few finalists out of nearly 600 proposals. Wow! What Did the Judges Comments Say? 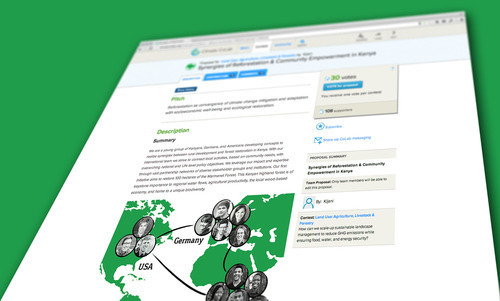 “Strong proposal from a competent team. Proposal for community-based reforestation in central highlands of Kenya. Very doable project by experienced group. They have done all the right things to get this in place, and I expect they will be able to carry it out. The impacts on climate are not large, but it’s a good start and can be an example for others. With these encouraging words from a group of professionals working in the field of climate change mitigation and adaptation in the land use sector we are launching our final push … the race for votes is on. 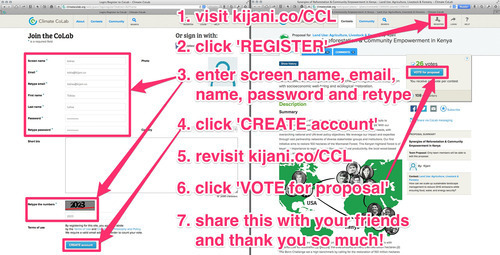 Visit kijani.co/CCL in you browser, or click this link. Click ‘REGISTER’ (unless you already have an account, then skip to step 6). Enter a screen name, your name, email, a password and retype the numbers. Go back to kijani.co/CCL in your browser. Share this post with your friends via Mail, Facebook or Twitter. We are very grateful for your support. Stay tuned, we’re just getting started. Join us on our journey to make every step count — count as a little victory for people and planet.